February 25, 2015 By Tina M 13 Comments This post may contain affiliate links. Read my disclosure policy here. *Please always exercise caution when working with small objects and children. 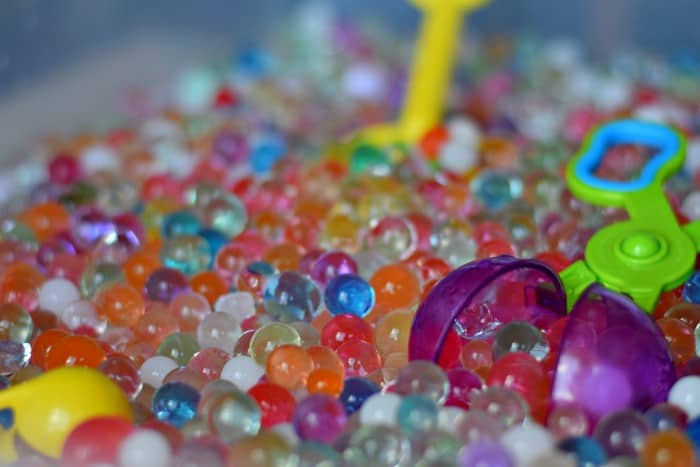 Make sure kids understand that water beads are not to go in the mouth. Waterproof Smocks. These aren’t necessary, but it kept their shirts from getting wet. Fine Motor Tool Set. 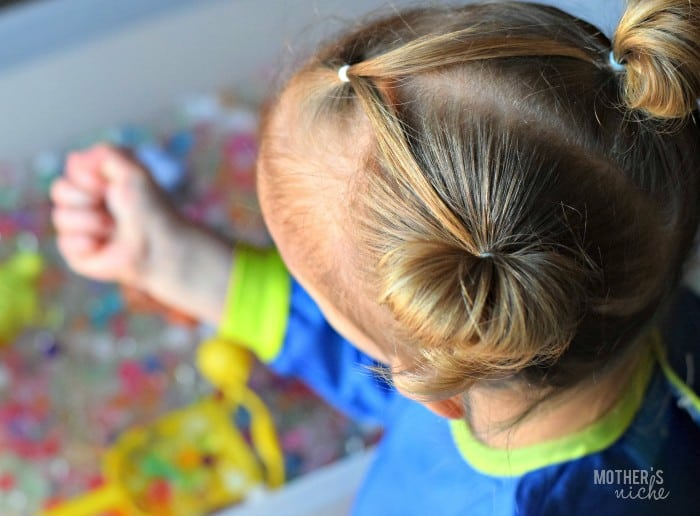 These were fun for scooping up and sorting the beads, and also help with fine motor skills. 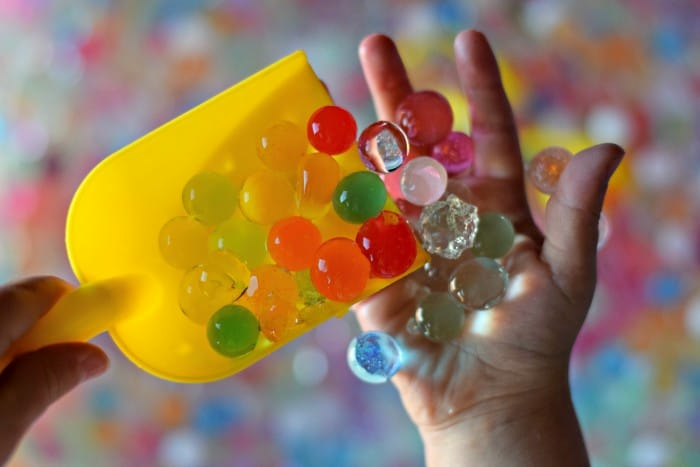 Water Beads. These ones are the best price I have found so far. You get 15,000 of them! They will last us forever! Sea Life Plastic Creatures. These were fun for pretend play! Another fun thing to use: kid’s hammer for squishing the balls! It would also be fun to use an ice cube tray to sort different colors. Here’s a picture showing how big they get comparative to their starting size. They grow to be the size of marbles! So fun. And here they are after a couple of hours. There is so much you can do with these! I had fun just running them through my fingers…over and over and over. Mommy therapy perhaps?? And as soon as it gets warm outside….we will be swimming in them! I LOVE this! I added it to my post about 37 creative activities to teach children their colors today. I’ll be buying these. Playing with them does look quite therapeutic. Oh my goodness! I’ve always wanted to learn how to do this!! Thanks for the tips and info! Your little girl is ADORBS by the way! 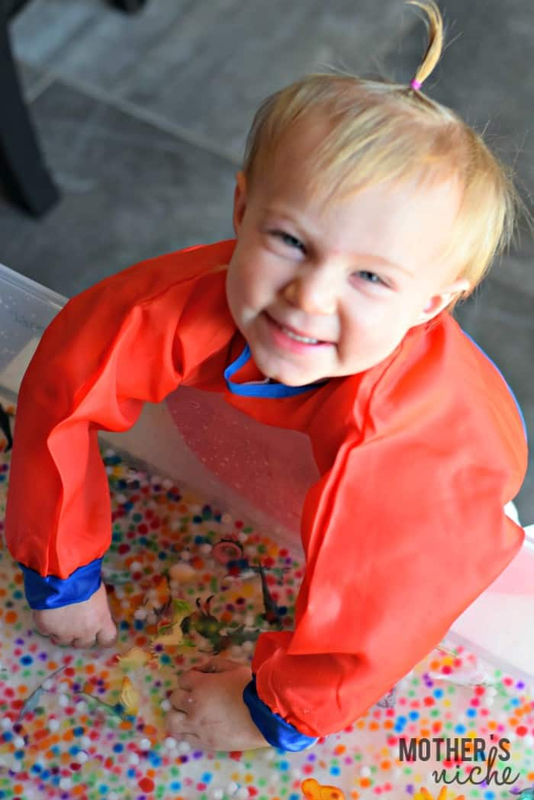 This is a great post, we love sensory tubs and these look like they would be super fun for my 3 and 6 year old! This is cute! My 22 year old bought some of these a few months ago and likes to play with them, so it is not just little ones that find them amusing. That is so cute. 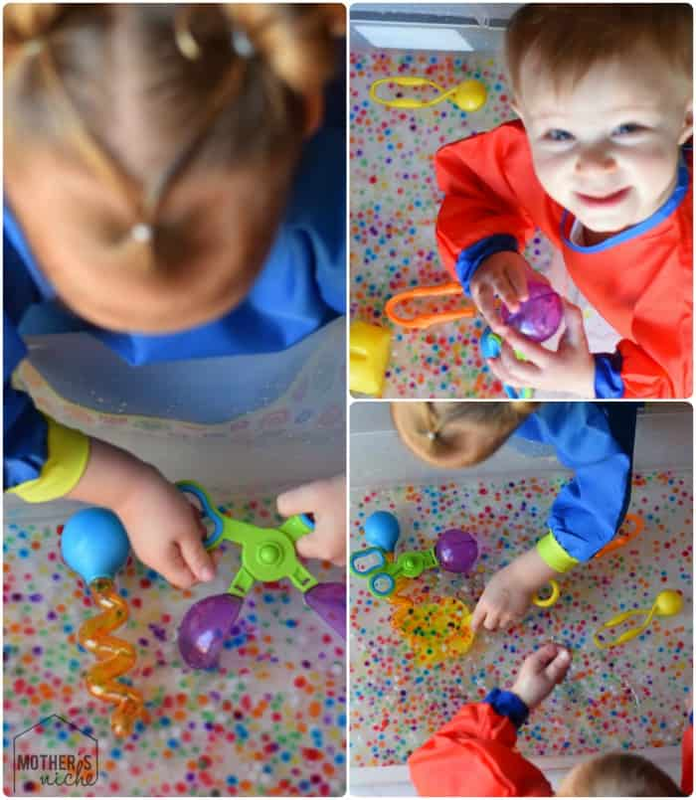 I have never heard of water beads before but it looks like fun! Ooh how clever! I almost want to order some just for myself. 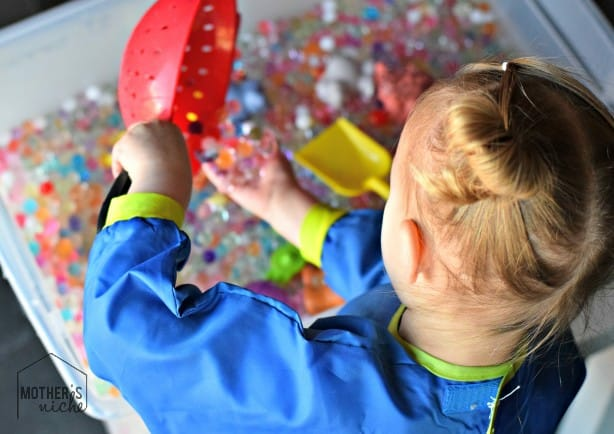 This looks like an amazing activity for the kiddos and I can’t believe how affordable they are. Cool! We get these at the dollar store every so often and the kids love them. This is such a great sensory project! OK, I am WAY too excited about these beads. They are AWESOME. And, $12 for 15,000? Seriously? You sure you didn’t put too many zeros there? 😉 Because that might be the greatest bargain ever. 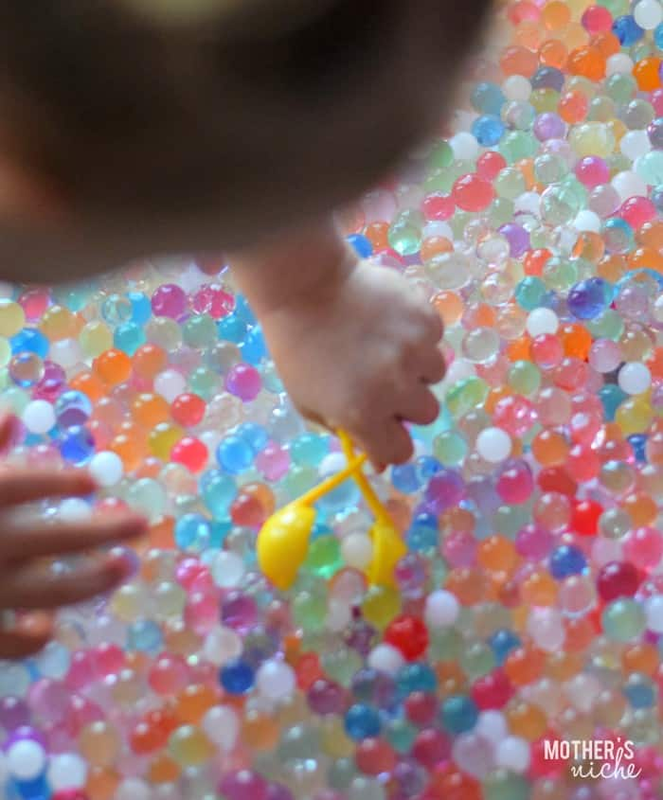 Those are cool, great for sensory! I don’t even think I’ve seen them in stores but I’ll have to keep my eye out now. What do you do with the beads when you are done? Does the water evaporate and they can be used again?